Last year I shared a fantastic TedX Talk by Fernando Ortiz of VertialGreen. Fernando starts his talk by googling "Paradise" to show us what comes up: pristine nature scenes. It's mindboggling to think that we had paradise and then developed it away. This fantastic company is dedicated to bringing nature back into our lives and making us more conscious of how vital nature is to our survival. Unfortunately this project didn't meet the Kidckstarter goal, but you can the visionaries here: www.verdevertical.com.mx/eng/index.html! PLUG & PLANT: The Smart Vertical Garden - Allows anyone to grow plants anywhere; it’s the easiest way to integrate nature into your everyday life. Allows Users To Plug In 12+ Plants, Water Once A Month, and Watch It Grow. New York, New York September 9, 2015. Vertical Green, LLC is announcing the launch of Plug & Plant, the all-in-one planting system with a modular design that lets you interconnect its components to transform any space into a natural ecosystem. Simply plug plants into a panel and watch them grow. 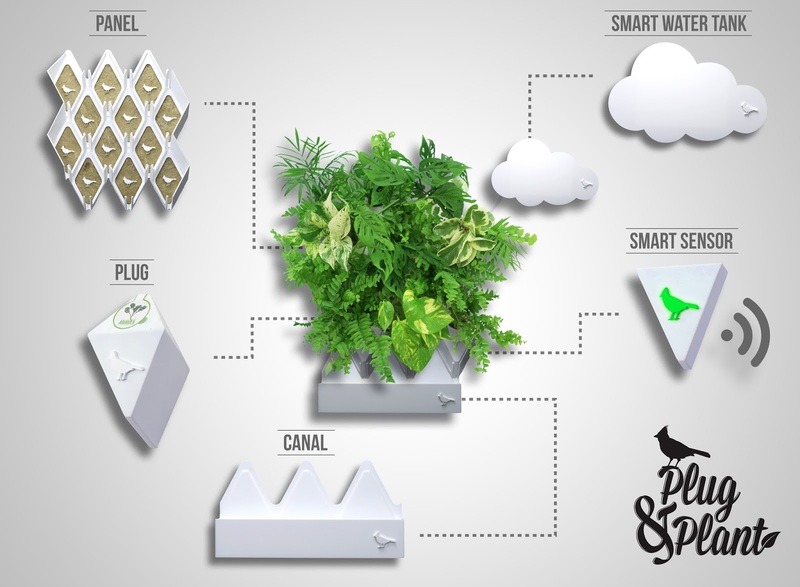 The Plug & Plant comes with five parts - panel, plugs, smart sensor, smart water tank, and canal. Users simply hang the panel on a sunny wall and place 12 plugs into each panel. Each plug contains the seeds and nutrients needed to make the plant grow, then accesses water from the smart water tank through a smart bio-foam. The Plug & Plant smart sensor continuously measures the environmental factors - including temperature, light conditions and the moisture of the smart bio foam - sending an alert to the user’s accompanying app with instructions on how to care for their plants. Users need only fill the smart water tank once a month as it supplies the plants with the exact amount of water needed through a dripping system; it only takes 10 minutes per month. Finally, the canal is placed in the lower part of the panel to catch all excess water, recycle that water, and keep your Plug & Plant system clean and dry. Available Plants. Vertical Green will initially offer more than 30 different types of plants for Plug & Plant. and even plants with medicinal purposes like chamomile and thyme. SMART: PLUG & PLANT is a smart vertical garden because its innovative sensor measures the humidity of the bio-foam, room temperature and the amount of light received. AUTOMATED WATERING SYSTEM: the PLUG & PLANT SMART WATER TANK is in charge of maintaining your plants with water for up to 30 days. DISPOSABLE PLUGS: You can choose between more than 30 different species of PLUGS to make a culinary, decorative or medicinal smart vertical garden. Each PLUG contains high quality seeds that start to grow in the SMART-BIO-FOAM as soon as the PLUGS are connected to the panel. The plants continue growing until their roots also connect to the panel, enabling them to achieve optimal growth. EASY-TO-INSTALL: Installing your PLUG & PLANT is so easy that any person can do it, you just need a flat vertical surface with lighting and 10 minutes to install it. AESTHETIC DESIGN: The PLUG & PLANT is designed with a clean and neutral aesthetic that allows any user to easily incorporate it in diverse spaces. CLEAN AND SUSTAINABLE: 100% biodegradable SMART-BIO-FOAM which allows the plants roots to develop the same way as they would in soil, without the soil. VERSATILE: The PLUG & PLANT is designed to adapt to your needs. That’s why its modular system allows your smart vertical garden to be as large or small as you wish. Here's a video to get you started! Regina Chouza is a qualified Energy Healer, Angel Intuitive and author of Self-Healing, Cancer & Love and Chakra Healing & Magick. 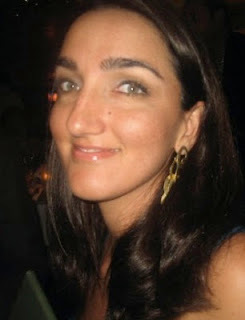 A graduate of the School of Intuition & Healing in London, she is developing a new technique that combines natal astrology, energy healing and crystals. Subscribe for an introduction to grounding, clearing and shielding your personal energy HERE. How can I back it? The links just lead to the leaderboard. Thanks! Was this project canceled? Or can I buy plug & plant vertical garden somewhere? Where can we buy in India? ?